Home Dining Chefs and Restaurateurs This Might Be the Most Inventive Breakfast Burrito in L.A.
Two fists needed for this beast. Brunch menus can be tricky. For every chef who aspires to put a creative stamp on the leisurely midmorning meal, there are plenty of stubborn customers who’d rather the kitchen “play the hits”: eggs Benedict, waffles, hash browns, etcetera. But what if those two goals weren’t mutually exclusive? At Mar Vista’s Little Fatty, a homey Taiwanese American diner serving beef noodle soup and walnut shrimp, chef-owner David Kuo knew he wanted his newly launched weekend brunch to stand out. So, true to the restaurant’s Chinese roots, he included dim sum favorites like har gow and shumai dumplings on the menu, along with congee, a soothing rice porridge, topped with dried pork floss and a preserved egg. 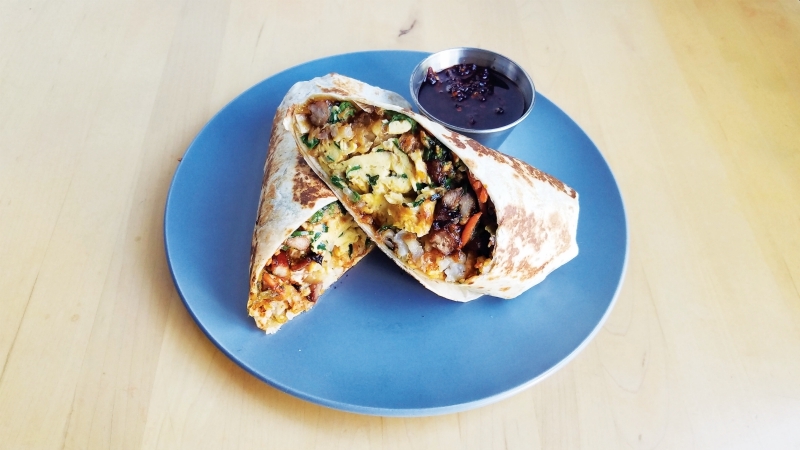 But in a wink to a SoCal staple, Kuo also pulls off a nifty Chinese-inspired take on the breakfast burrito. Tater tots coated in a mixture of Sichuan peppercorn, cumin, and coriander provide a crunchy foundation for the soft-cooked omelet. Studded with chives, it’s wrapped around bean sprouts tossed with hoisin sauce, pickled mustard greens, and sweet house-made Chinese sausage. Somehow the two-fisted beast is bound in a toasted flour tortilla, with chile sambal and sour cream for dipping.